On the Beaten Path: Beginning Drumset Course Level 2, Drums tuition/press from Alfred Music Publishing. 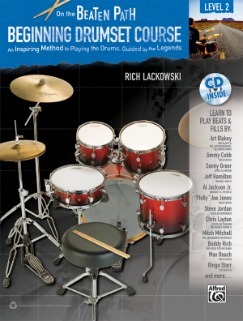 On the Beaten Path: Beginning Drumset Course is a three-volume drumset method that teaches you how to play the drums using selected beats and fills from hit songs made famous by legendary drummers. Each book includes transcriptions and lessons with tips, tools, and terms throughout to introduce concepts at the right place. Also included is an accompanying audio CD containing all the beats and fills presented in the books. Level 2 picks up where Level 1 leaves off, and teaches you to play with 50 authentic blues and jazz beats and fills by drummers including Steve Jordan (The Blues Brothers), Chris Layton (Stevie Ray Vaughan), Max Roach (Miles Davis), Buddy Rich, and more. You'll also learn to play double-stroke rolls, buzz rolls, the 9-stroke roll, accents, rim clicks, ghost notes, crescendos, and decrescendos. You'll also learn valuable concepts like call and response, reading and playing cues, and improvisation. 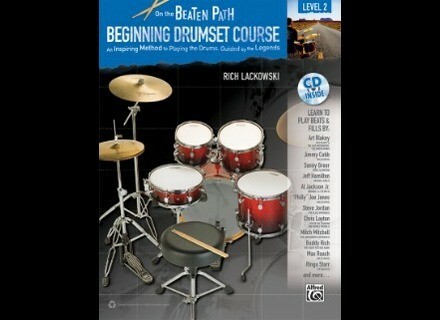 On the Beaten Path: Beginning Drumset Course, Level 2 is now available for $14.99 as a book and CD set. Level 1 is also available, and Level 3 will be available on November 5. For more information on this series, visit alfred.com/onthebeatenpath. Drumset Method Complete Edition Alfred Music Publishing released Drumset Method Complete, a comprehensive method comprising three books for drumset.